A new unit featuring members of Hello! Project has been announced with the name Happy! Style. The group features Hello! Pro Egg leader Noto Arisa, Hello! 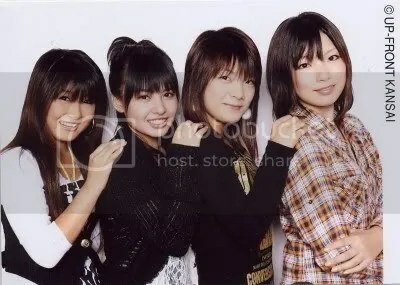 Pro Kansai members Nakayama Nana, Iwashima Manami, Abe Asami and Suma Ai as well as two newcomers; Aoi and Yui. The group is with Up-Front Style and will sing well known anime themes and idol songs. The unit has so far not been announced as a part of Hello! Project or TNX, I imagine it will simply remain an Up-Front Style group. Also check out the pretty basic Happy! Style website which has information on their first live which will be on 2008-05-06.
im excited i can’t wait to hear there music. im sure it will be great. thats good that they’re using the hello pro eggs more. i can’t believe kusumi koharu isn’t in this group. jk. I’m not sure if this group will necessarily have single releases. Gah, another unit of eggs? I can’t keep track of all these new units. o_O. I guess I should try and listen to this more, since I haven’t listened to the Canary Club or any new ones like that. I’ll try with this one. oh ok. ya i read something about them just performing anime songs a other songs. Canaria Club doesn’t have any members that are also members of Hello! Pro Egg. I reckon he’s going to fast with these new units. I mean some haven’t even made their debut, and already he’s making another one.